This is an update to the previously posted FRS/GMRS Radio Primer article by John Beaston. 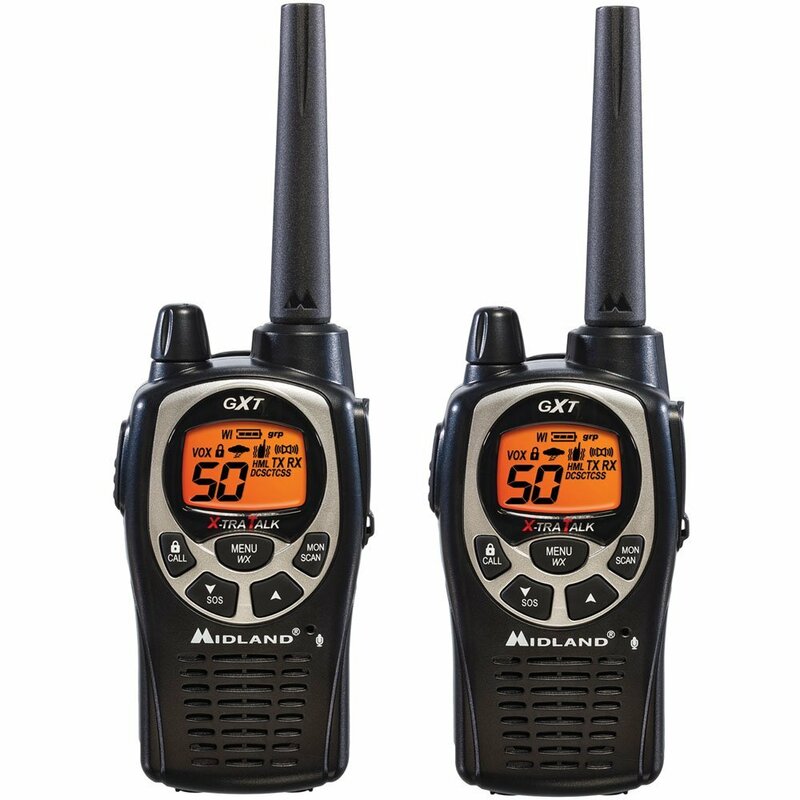 With the stroke of the pen, most hand-held, walkie-talkie combo FRS/GMRS radios will be reclassified as FRS-only radios. This was accomplished by raising the FRS maximum power level regulation to 2 watts (which covers the HIGH power setting on many radios) and by expanding the allowed FRS channels to include all 22 channels. These regulatory changes fold most existing radios under the FRS umbrella. And since the FRS service has no license requirement, any NET will be able to use any of the 22 channels. What happened to GMRS? Well, it’s still there for those wanting higher power levels, detachable antennas and/or repeater operation. The GMRS channels now overlap the FRS channels so the two services can inter-operate on all 22 channels. GMRS users can still use up to 50 watts, have detachable antennas, and operate repeaters. As previously, a no-exam, $65 license is required but the license term has been extended from 5 to 10 years. As before, a call sign is issued and transmissions must be identified every 15 minutes. Basically, the potential for unwanted interference is so much greater with 50 watts, repeaters, and the potential of larger, higher antennas, the FCC wanted to be able to identify a user if it became necessary. Note that higher power combo radios (such as the Midland GXT1000) and radios supporting repeater operation (such as the Motorola MS350R) will be reclassified as GMRS. 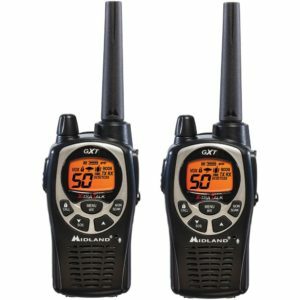 A GMRS license would be required to operate these radios. Eventually there will be no more combo FRS/GMRS radios. Any particular radio will be classified for one service or the other. The new rules took effect at the end of Sept 2017. Some provisions for manufacturers are phased in over 18 month to two years. This allows manufacturers to clear inventory, adjust marketing and develop new products. 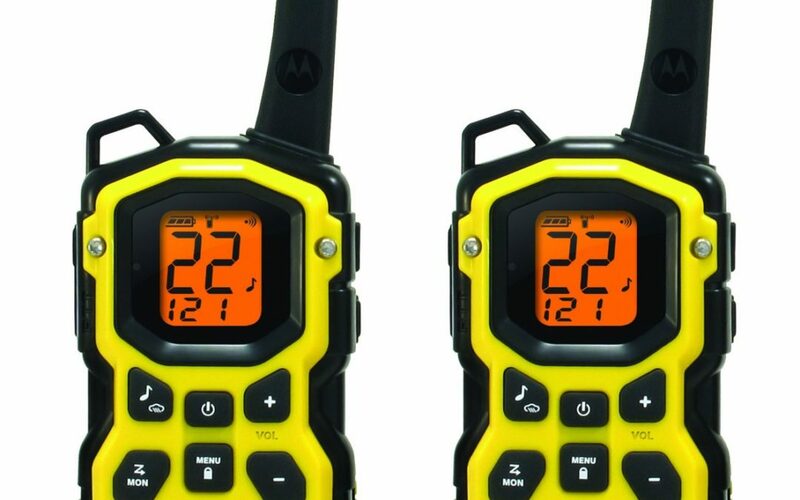 BaoFeng (and other wide-coverage walkie-talkie) radios are still not legal for transmitting on FRS or GMRS channels. The FCC ruling acknowledges that such radios exist however they explicitly deferred allowing their use on FRS or GMRS. The part of my personal preparedness that has taken me the longest to complete, and given me the most confusion, is water storage. I’ll share what I’ve learned so far, to help all the other confused procrastinators out there. First I tried buying water in gallon containers or saving extra water bottles. A few got leaks as they got jostled around during camping trips, and I discovered their thin skins are best kept safe inside sturdy plastic containers and not moved a whole lot. My ultimate goal was to store tap water in large quantities because of my aversion to paying for overpriced water from a corporation that might be taking it from a community that needs it more (see: Nestle/Cascade Locks water disputes). We have great water quality in Portland, anyway. But I wasn’t sure what kind of containers to use or how to sanitize them properly. As I had a lot of glass mason jars on hand already, I decided to “can” my water. I used a sanitizing spray that I’d bought for kombucha-making on the jars and their lids. I filled them with water and put them inside a very heavy duty plastic bin from Home Depot in my basement. A couple months later, after learning more about the importance of sanitizing, I started doubting the integrity of my jar/lid seal (they didn’t have rubber seals), and decided to try a different method. I found myself at REI with some dividends to spend and a sale going on. 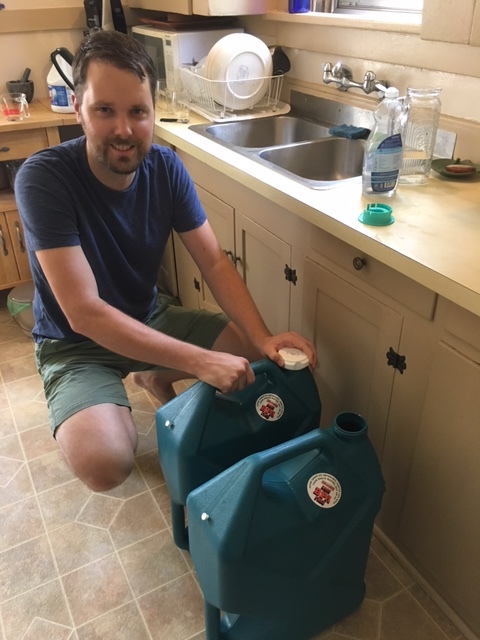 I knew I wanted to get some preparedness supplies, so I got the only water containers left – two 14-gallon containers that were quite large. I knew I needed to get up to that 14-gallon minimum because of the 1 gallon/day/person for two weeks rule of thumb. When I got home, I filled them up with water and left them in the basement. Later on, I learned you have to sanitize the containers with a touch of bleach before you add the water. So I poured them out, let them dry, and started over. It would be best to get water containers that fit into the kitchen sink so you can pour it directly from the tap into the container. Mine were too large, so we had to sanitize a pitcher, then pour it into the container. Also, I didn’t realize how heavy they would be once filled – I could barely carry them. Water is 8 lbs a gallon, so you know, you do the math. Alternatively, a hose connection could reach from the spigot to the container. Ideally, a split connection with a timer, so you could just set it and come back to it when it was done. 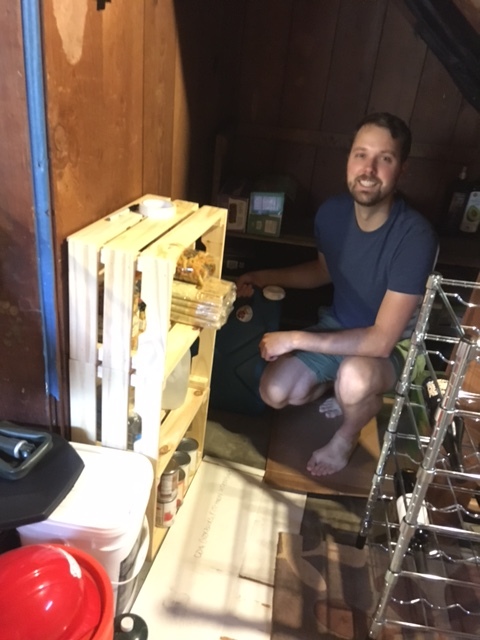 I know that homebrew stores have hoses because I dabbled with kombucha making, and that’s partially how I started learning about water storage. You may have to do this sanitizing process every six months for the rest of your life (see below). So you should label your containers with the date you filled them. Since this process is time-consuming, streamline it as much as possible. Get that hose, or smaller container, so it’s easier for you to do it. We didn’t think the step of rinsing with soapy water was really necessary since the bleach rinse comes right after. The only way to tell if the sanitizing really worked is to check the water for scuz and taste it the next time you repeat the process in six months. If you’re bottling water yourself, many recommend that you change it out every 6-12 months. Or you could add 1/8 teaspoon of chlorine bleach per gallon of water stored. This precaution will protect you against any lingering organisms that may have been inadvertently missed during the cleaning and/or filling process. You don’t need to change it out every six months if you’re using commercially bottled water. Plastic may leach into your water over time, but in a true emergency it’s better to have more water than less, and short-term exposure to plastic will probably be the least of your concerns. If the thought of rotating your water supply overwhelms you or in any way prevents you from storing more water than you currently have – forget about it. Just get more and let it sit. You can always add bleach to it after a disaster strikes if it seems icky. 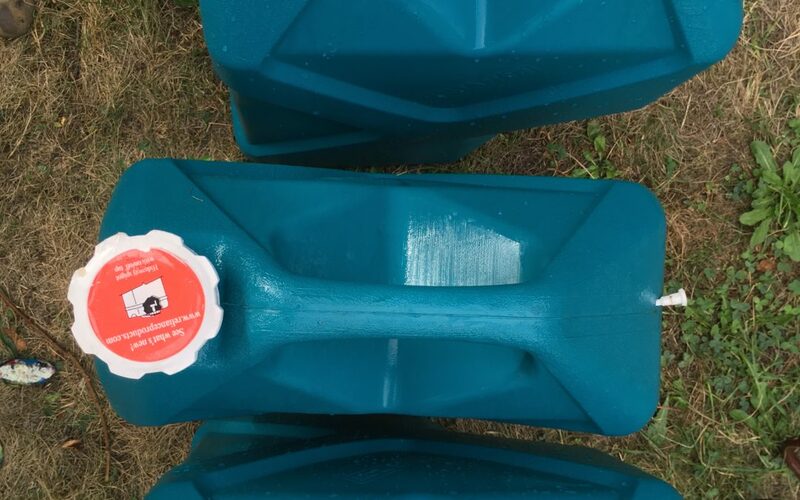 Want to help encourage others to store water? Take the #14GallonChallenge!